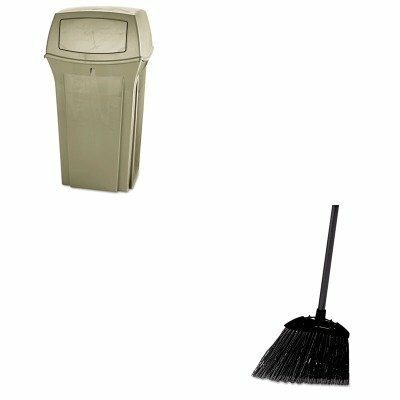 KITRCP637400BLARCP843088BG - Value Kit - Beige Ranger Container, 35 Gallon (RCP843088BG) and Rubbermaid-Black Brute Angled Lobby Broom (RCP637400BLA) by Rubbermaid at Blog Free Here. MPN: RCP637400BLARCP843088BG. Hurry! Limited time offer. Offer valid only while supplies last. lt;stronggt;RCP843088BGlt;/stronggt;lt;BR/gt;Beige Ranger Container, 35 Gallonlt;BR/gt;Durable structural foam construction designed for outdoor use. lt;stronggt;RCP843088BGlt;/stronggt;lt;BR/gt;Beige Ranger Container, 35 Gallonlt;BR/gt;Durable structural foam construction designed for outdoor use. Withstands extreme weather. Permanently attached hinged lid. Metal retainers keep can liners securely in place and out of sight. Waste Receptacle Type: Side Opening Materials: Structural Foam Application: General Waste.lt;BR/gt;lt;BR/gt;lt;stronggt;RCP637400BLAlt;/stronggt;lt;BR/gt;Beige Ranger Container, 35 Gallonlt;BR/gt;Cut and shaped for easy sweeping in hard-to-reach areas. Flagged, acid-resistant polypropylene fill bristles. Will not stain, discolor or absorb odors. Can be used wet or dry. Overall length 35amp;quot;. Application: Spot Bristle Material: Polypropylene.